Ignore, for a moment, the series of Internet-based polls that John Zogby released today. What else do we see? We see John McCain continue to consolidate his advantage in red states like Utah and South Dakota. We see Nevada polling pretty close to the national averages, as it has all year. Right now, our model forecasts a 2.2-point victory for John McCain in Nevada, versus a 2.4-point victory nationwide. Just as was the case when Barack Obama was leading in the national polls, the key metric for determining resource allocation is not a state's standing in the absolute sense, but where it stands relative to the national numbers. Nevada remains an important state because it's polling so close to the national averages. Conversely, something like Wisconsin, though certainly winnable for John McCain, is polling about 7 points better for the Democrats than their national estimate, which means that it is unlikely to be a decisive state. New Jersey is also a good example. We see some evidence that it has tightened (Marist has him 7 points ahead among registered voters -- the version we will use until the first debate -- but just 3 points ahead among likely voters). But it is still polling at a considerable enough distance from Obama's national averages that it is unlikely to serve as any sort of tipping point. We do see a couple of polls showing Obama's numbers holding up reasonably well in the Pacific Northwest, though the Elway poll in Washington is a bit weird. They split their sample into two, using different phrasings for each group; half the sample was asked a question that included the names of the VP candidates (e.g. "Barack Obama and Joe Biden") and half got the top of the ticket only. Obama led by 9 points with the veeps included and 6 points without. Each of these are perfectly valid ways to ask the horse race question, so we simply average the two numbers and combine the samples. 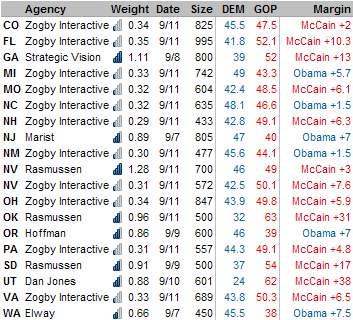 ...As for the Zogby Interactive polls, I tend to prefer to let them speak for themselves. Obama ahead in North Carolina but 6-7 points down in Virginia? I don't find that especially credible. Anyway, they're in our model, but given a very low weight.